Review: "Bonita BPM knocked out all other BPM suites!" We have had successful Bonita BPM installations in verticals such as telecommunications, manufacturing and the public sector. With Bonita BPM we have solved problems in project management and customer service. Review: "Bonita BPM - Low cost, low code efficient platform"
We are using Bonita BPM to a small extent, because we are small organisation. Bonita BPM is used mainly for supporting contracts management. Our experience is built on deploying the platform to our clients. It is a very low cost platform. You can start with open-source edition which is free and with the application number growth upgrade to subscription editions for more features and support. Subscription editions are still not expensive compared to bigger players platforms. It offers a great UI designer tool for rapid building process forms and web applications. It gives a lot of flexibility and extensibility. It comes with features like built-in connectors, convenient API, and a web portal. You can add your own connectors, extend the API and customize the portal for your own needs. It is well suited for well defined workflows. It could be tricky if the process and its subprocesses work on the same data. Dynamic case management is not supported. Bonita BPM Review: "BPM with BONITA : the glue of our Information System to make interact ERP, CRM and human users"
Dynamic interfacing between IT applications including human interaction. The interface has been dynamically adapted according to the various events managed by the BPM process. It's used at the company level to enable communication with the Customer Services team using CRM Salesforce cases, and with R&D team using Clearquest as a bug management tool. The Bonita BPM process is the basis for dialog between Customer Services and R&D teams. It is well suited to mixing IT applications and human interactions in numerous dynamic combinations. It is less suited for mass data transfer with few case management combinations, where an ETL tool would be more efficient. Bonita BPM Review: "Bonita is our platform of choice for BPM implementations and more"
We have used Bonita to replace a couple of manual approval processes for our procurement department. Building a responsive UI for the process users. Building integration with LOB systems in the form designer now requires implementing REST API's. This is a development overhead, and should be simplified. The studio should include more options for handling exceptions. Environments which have dedicated engineers and testers can benefit the best from Bonita. We don't have Bonita currently in our organization. We have several projects in progress for particular clients for which we offer consultancy. Bonita UI Editor is using latest technologies and is very easy to develop. You have complete freedom. Living application as part of version 7 brings huge functionality for custom development. Modifying case instances in production environment can be easily done from the portal. The big list of connectors. 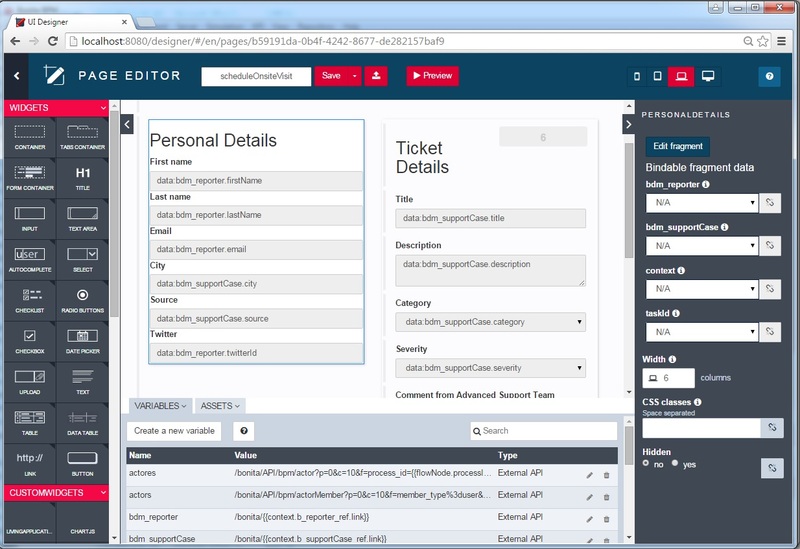 API system allows you to easily access all the data you need. The BPM API system has no security and all authenticated users can access data with no restrictions. This can impact data security across different departments. You have no option to deploy processes directly from Bonita Studio in the production environment. Security for Bonita's Java API system should also be reviewed. Normal users should not have the possibility to access engine information. Bonita bpm is well suited for workflow applications. Bonita was the easiest to understand and develop with however I wouldn't recommend this in a bank environment. Bonita BPM Review: "Ease to develop and good choice of enhancements between releases"
Bonita BPM is being used by the credit analysis departments, regarding credit card authorizations, car credits, and so on. The application in which Bonita BPM is involved, aims to address automatization, control and traceability of credit factory processes, where too many different skilled people work. These kind of applications allows managing staff keep control of what and how their core processes are being executed. Bonita BPM is especially well suited for applications or environments where performance and ease of changes are the main technical priorities. Bonita BPM Review: "Bonitasoft is good for business!" First Digital Solutions provides implementation and support to Bonitasoft users/customers. The platform is very user friendly and enables complex business processes to be designed and associated applications implemented quickly and efficiently. Furthermore, the extensive range of connectors means that applications can be easily integrated with other systems. We look forward to working with Bonitasoft on a mutually-beneficial basis in the long term. 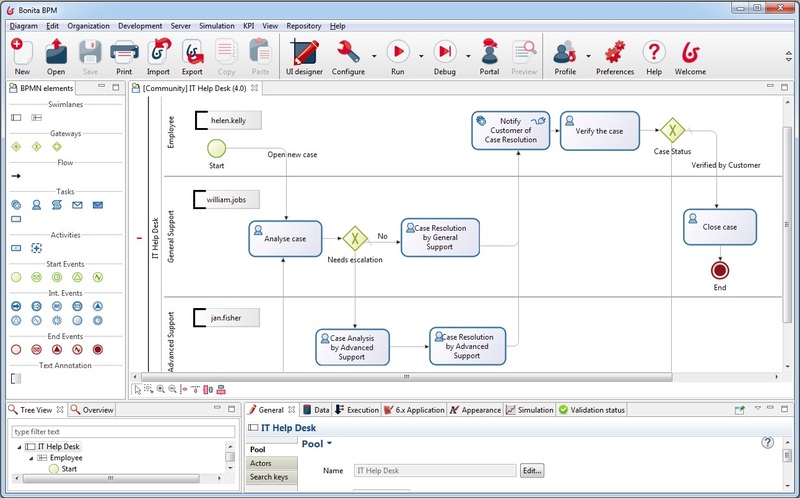 Easily design workflows & business processes using the GUI studio tool. Develop responsive web-based applications quickly and efficiently. End users can easily modify BPM applications without needing any code expertise. Be able to be implemented on LAMP Stack. Make it easier to upgrade between versions. Reduce the need for high-level Java expertise for developing applications. Bonitasoft is very well suited for workflow based applications where there are dependencies on both human and computer-related tasks. Bonita BPM Review: "Whey we looked at Bonita." Bonita BPM provides a single design and runtime environment for business functionality. Using the Bonita Forms and BPM process runtime we can enable accurate electronic data capture, assign responsibilities and escalation for form pressing and monitor and measure the effectiveness of our business functions. Further we have compared Bonita to a range of other BPM providers and found that it meets the expectations with a competitive advantage in agility and price. Delighted to recommend Bonita. Dynamic form data capture, with validation and cross references. Process flow control with excellent roles and responsibilities allowing the ability to get the right information to the right person at the right time. Fantastic extensibility, both in the GUI and workflow connectors. Allows us to make the product meet customer requirements. Great bang for your buck, compared to other BPM products in the marketplace. I would love to see the process activities pre populate GUI fields, there are excellent REST capabilities, however a gap from the uplift from v6 to v7 is the auto mapping of data form a process activity into a the form. Having to retrieve it from the inside the form is cumbersome. Would love to see GIT support in the designer to allow for integration into modern SDLC and CI/CD tools. The ability to have a subscription licence work after an AWS node rebuild or a docker container rebuild would be a definite need. Licensing tools that support modern CI/CD and cloud scalability models. Run the Forms GUI as a web view inside the Eclipse runtime, better continuity of design tools and stops the incessant screen hopping. Well suited for small to medium business who require forms capture and agile data processing. User Review: "Bonita BPM Rocks!" I am currently using Bonita BPM to enable care coordination services for patients who are receiving care at home and in skilled nursing facilities. Excellent process authoring studio and experience. Fully featured but incredibly extensible. Excellent ability to author and attach forms, using a system that de-couples form development from the process engine but still has a powerful form environment. Difficult to understand the difference between the pool and the first task. The UI barely differentiates them. Sometimes this is confusing to new users who click the "start" icon instead of the pool and lose track of where the starting contract is. Need a better way to deliver forms that does not use IFRAMES. Very appropriate for teams building applications and that have Java/DB experts to assist the business analyst. Not well suited to environments where just a business analyst wants to deploy a practical application. Needs more help and "out of the box" groovy scripts for common tasks, especially using the Engine API. Bonita BPM Review: "Your best bet for business process"
Bonita BPM is the principal tool we are currently using to automate our processes. So far the experience has been excellent. We have deployed two processes with Bonita BPM to manage employee travel requests and vendor payment. We are currently working on our credit approval process, we expect nothing less than excellence in that too. Bonita BPM will work well for any organization, it is simple to use and robust at the same time. Bonita BPM Review: "BPM Made Easy with Bonita"
It's used for what it's intended for, the business project management process. It is currently being tested and demo scenarios are created for customers' review and approval. It's easy to manage the process with standard functionality, in a rather short time frame, but if you need custom functionality it may take longer. Bonita BPM Review: "Welcome to BPM with Bonita!" Bonita BPM is used across the whole organization, we use it for all kinds of business processes in the holding and also the other countries. We have processes for vendor claims, trainings, and investment requests. The modeling tool is very easy to use, it took me less than 20 minutes to create and deploy my first application. The large number of connectors is a plus, we manage to connect our application to SAP & Alfresco. We use a lot Bonita APIs, that way you can use the BPM engine in any business application. The administration console can be improved, for example, it's not easy to access the logs when you have a problem. The new forms are responsive in design but there is no mobile application! I would like them to add a milestone feature. With a milestone, it's more easy to follow complex business processes. Bonita BPM is well suited to develop new simple applications or new applications on top of an existing ERP. But you need to have good integration skills on your team to be able to do that. Bonita BPM: "My bonita's review"
Why did they not implement gmail authentication? Bonita is powerful tool for implementation of process. Review: "Bonita BPM - A powerful and scalable solution"
Bonita is mainly used for our order entry processes. It is also used for workflow for order approval and integration with Oracle R12. 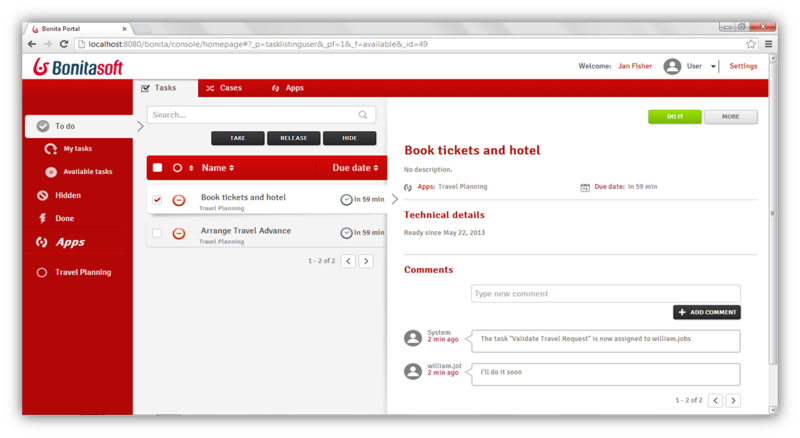 Easy worflow design and update. Form creation can be done by non IT resources. Roles and users are really managed well. The web portal does not allow advanced search. Standard connector does exist for SAP but not for Oracle EBS. Any workflow activities can be managed by Bonita. It is a very scalable system and easy to implement. Bonita BPM Review: "Great Open Source BPM tool"
We are using it as a VAR to support our product development. We like it that it is open source. Easy to use with good management tools. We like to see more API tools to allow integration with third party tools. Better report writer and analytics tools. Our project was to create a self-service portal for onboarding to specific engineering applications my team deployed and supported. During the design and architecture phase of our project, we evaluated multiple methods of creating workflows for our users and settled on BPM and Bonita specifically. We attempted to then integrate that with our online presence which was an AngularJS application with a Java/Spring/Hibernate backend. Creating workflows for evaluation of the product was easy. Makes comparing against other tools easier and quicker. Integration with AngularJS applications is documented and supported. This is good for existing applications you want to expand with workflow capabilities. Applications where you don't need the full UI capabilities of Bonita and just need a plain workflow implementation is where I'd choose a different product than Bonita. Bonita BPM Review: "Flexible Business Project Management tool"
Bonita BPM is currently used in the department that manages system integration and identity management projects. It's also going to be used for managing internal processes in our organization. Typically it addresses digital identity lifecycle management requisites (enrollment of users, enrollment of services, and workflows for managing internal authorizations). Features that in the new version are no longer supported. No, as a general tool there are a lot of scenarios for which Bonita is well suited. It is less appropriate in processes where there are very few actors. Bonita BPM Review: "Bonitasoft helps you to do the housework on you obvious interfaces"
Bonita helped us to address two challenges: connecting editor applications to make interfaces and data exchanges between them, and processing workflows of dedicated processes within the company. The main challenges were to be able to create interfaces without having to hire external contractors to develop them, and taking advantage of this BPM tool, just by setting up the tool and by making the way we follow data exchanges between applications easy. Bonita simplifies the way to produce interfaces between applications of the market. Bonita reduces time to implement interface and time to maintain interfaces, using standard connectors. The IDE helps to draw a user friendly chart to accelerate deployment of process and increase process governance. Bonita forms are not highly customizable in terms of design. Some updates may break down your interface. A "test mode" on a virtual appliance with replicated copy of your [production] environment would be a great improvement. There is no ctrl-Z, no undo or redo, in the UI Designer editor. The in/out arrival process for interns and employees is an example of a process where a company can achieve a significant result in a reduced amount of time. This is particularly right with the prepackaged processes fully furnished by Bonitasoft when you pay for annual maintenance. More pre-packaged processes based on standards exist and are furnished by Bonitasoft. Bonita BPM Review: "Bonita a workflow tools"
We are currently implementing Bonita in my company for the following process onboarding, offboarding, leaving requests. The challenges we are facing today is the business value that is not well understood by the business regarding what an application like Bonita can provide them. They would like a big data from workflow but that's not the purpose of a software like Bonita, it's only a first step to do that! My management don't understand why we cannot access to document when cases are closed. Bonita form cannot be accessed anymore when case is closed. Review: "Bonita BPM - not yet ready for continuous integration"
Bonita BPM is used by the IT integration team to manage certain business processes. Other departments (typically customer care) may use the Bonita web application if they are involved in the process at some point. Bonita is used for processes that typically involve human interaction (not necessarily via Bonita) or long-running asynchronous operations. Such processes concern mostly life cycles of certain transactions that require asynchronous input from multiple systems. In this regard, Bonita is not so much used by humans as controlled by messages sent by other systems. Bonita seems particularly suited for processes requiring a great deal of human interaction. Its user model allows you to control access to business processes in a fine-grained way. This allows for business processes to move smoothly between users and services as the process advances. The definition and usage of custom forms from the latest version of Bonita seems particularly powerful. It allows for a thorough customization of the look-and-feel and does not require complex developments. The web interface and administration section have greatly improved in the latest versions. Installation and configuration of processes has become more flexible and more structured. The administration section gives a good view on failed processes, allowing to analyse problems in an efficient way. From a technical point of view, Bonita is not well-suited for integration in a development environment. Upcoming support for 'unit' testing and continuous integration seems bloated and overly complex. Its starting point is clearly the Bonita point of view, not the development point of view. To integrate Bonita efficiently in a continuous integration process, it should be possible to: completely build a process .bar without having to start the studio and/or server (typically a single maven plugin); deploy .bar files in a maven (or other) repository; start an embedded Bonita server automatically when running unit tests. The usage of images and the (apparently mandatory) integration with Jenkins make this more complex than it should be. The constraint to deploy only one database model on the server is particularly painful. It necessitates that unrelated processes are combined into the same repository. In fact, it completely nullifies the possibility of having multiple repositories. While it is definitely a great idea to allow process parameters to be configured in the web interface, it would be useful to allow import (and export) of these parameters as a .properties file. Currently, a re-install of a process requires you to reconfigure these parameters manually (not nice if there are more than a few parameters). It is very unintuitive (and even illogical) that the XOR operator is named as such, while it does not act as an Exclusive Or when used with multiple incoming flows. Mapping of values (message variables, process and sub-process variables, step variables) is often inconsistent. Certain cases allow the usage of scripts, others don't. Same for calling Java methods on an Object. Making this more consistent would avoid surprises and probably create lesser bugs. Data operations at the entry of a step would be useful too. Bonita BPM Review: "An opinion about Bonita"
Bonita BPM is good software that makes it to possible implement a sequence of steps quite easily. In the HR department, for example, we implemented an important process with a concrete result. It resolved a task that created a simple way to follow a process. The documentation does not have enough samples or examples. This is the weak point of Bonita BPM. Processes and workflows with specific steps are good scenarios to be implemented. Scenarios with steps that go in many directions (like star points), or that concentrate on many tasks, are not recommended. It's very important to be able to map very specific steps in your process. Review: "Bonita BPM as a versatile tool for process management and software systems interfacing"
Bonita BPM is mainly used in our organisation to synchronise data between two database systems (SFDC and Clearquest) based on decision workflows for bug resolution tracking. Make interfaces between two system easy to modelise and to maintain in the long run. Avoid customised development or specific webservice interfacing to exchange data between systems following a workflow. Give the needed flexibility and ease of maintenance to automate internal activity processes in a versatile and agile way. HR workflows look to be an easy target for Bonita to automate - for example, new arrival or departure of employees in a company. Approval and escalations can also be a good business case, where specific industry-oriented applications can be eased by Bonita such as Media asset management in Digita TV production environment. Bonita BPM Review: "BonitaBPM Why or Why Not"
We are a software company that uses Bonita BPM as the BPM Engine to customize our clients workflow processes and deliver a superior and high scale product that can be utilized in their every day needs within their departments/organization. The clients range from defense contractors, private contractors and a few select commercial companies. Bonita uses JBoss and is very easily integrated with Java if using API calls or even their REST services. Bonita has the use of JasperReports which makes it easier for us to build reports on our own and attach them as part of the process. Bonita Development Studio is very slow in performance. It's built on top of Eclipse BUT one needs too much patience to work with the development studio. I have used up till v6.3 so I am not aware of the latest and greatest features on v7.x. But I would like full control on what we can display and how we display things on BPM Admin and User Portal to the customer. Be able to use latest and greatest technology like Angular and less frameworks (They already have less). Development Studio should have the capability of communicating with an enterprise database server such as SQL or Oracle. The inbuilt Bonita Database is not that reliable for developers. Bonita is a open source solution out there which makes it much better for usage by developers who are integrating Bonita BPM with their applications. It can be used to manage processes with finance departments, security departments, human resource departments and pretty much everything an organization does. The only place I don't see it being used is with a visitor management solution to be able to screen and process visitors by integrating with hardware devices such as passport scanners, digital signature pads and badge printers. Bonita BPM Review: "Bonita: great tool, poor documentation or support"
Bonita BPM is used to provide tools and workflows for some of our procedures. It's been implemented across a few departments. Sometimes it helps, but most of the times creates more problems than solutions. User Review: "Bonita BPM for Universities"
We are a university consortium and we offer Bonita BPM as a facility for our customers, for many uses - for example new student enrollment or for the management of various administrative aspects. 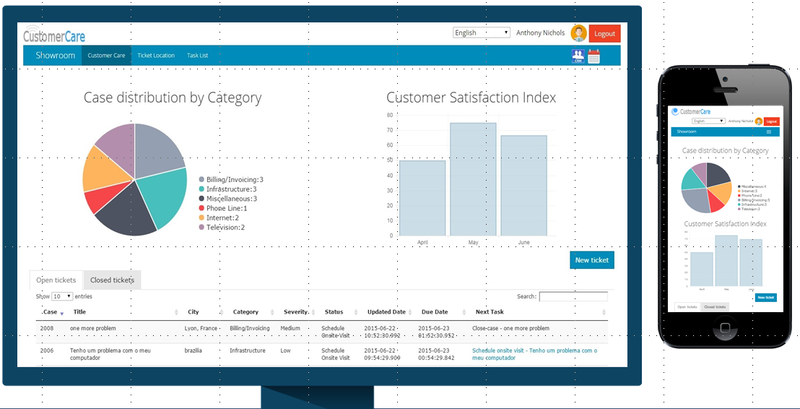 Also currently under evaluation is the adoption of Bonita BPM for internal use. an Eclipse based, modeling and development environment which allows business analysts and developers to graphically design and share processes using the industry standard BPMN 2.0 notation. a web based, drag and drop designer, based on HTML5 and Angular JS, to create personalized user interfaces for BPM applications, including web pages and process forms. It is highly extensible so developers can build their own interfaces using standard technologies. a powerful and scalable Java-based process orchestration engine build on service-oriented architecture. It is flexible enough to adapt to any information systems architecture, from simple to complex while supporting intensive workload. a web-based, out-of-the-box, portal for users and administrators to perform their day to day task. While this is a generic BPM application, users can also completely customize the end-user interface.